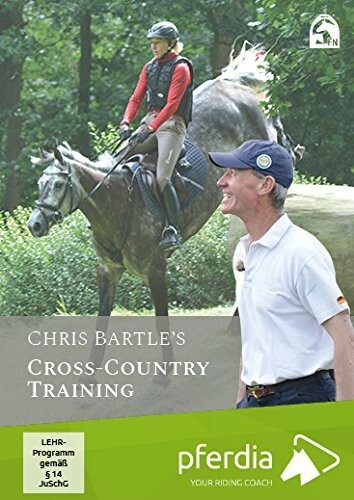 In this film Chris Bartle, coach of the British national Eventing team, passes on his years of experience by giving eventers the capabilities to ride safely through the cross-country course. From a forward light seat to the 'oh sh*t' position, Christopher Bartle, coach of the British National Eventing team, wants to improve safety in cross country riding and prove seat positions are the key to success. Chris Bartle's practical analysis of examples from training and professional sport reveal the sources of potential mistakes and provide a path to safe cross-country riding. How safe seat positions can help you to ride successfully through the cross country course. Which 5 cross country seat positions should be known by every cross country rider. How you can sit in balance with your horse both before and after the jump. Which are the most common seat errors and how you can avoid them. How the 'oh sh*t' position can rescue you and your horse from difficult situations.